You didn’t think that now we know what Samsung’s #GALAXY11 promotion was all about the story would just sublimely end there did you? No-no-no-no, the real action is just beginning. The team that is tasked with saving planet earth in a galactic scale soccer football game is now in orbit. 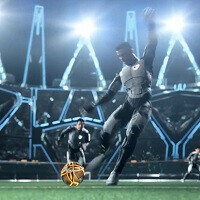 The team, handpicked and the world’s best, must face the aliens, and if #GALAXY11 lose, the earth is doomed. The match has begun and as such drama would unfold, the first half is over and frankly, we’re getting our butts kicked. Being a Samsung campaign, the team may yet pull an advantage, thanks to the Galaxy S5, Gear 2 and Gear Fit. All of which may have a feature or two that could come in handy when fighting aliens, or competing against them anyway. If you want in on the action, you can download several games in the Samsung Apps store, or Google Play. While we’re not sure how this particular game action will play out, we are pretty confident how the story will end. #GALAXY11 will prevail (thus saving humanity), and it will be because of Samsung’s line of gadgets, but really we’re just guessing. Who ever directed this did a nice job. Thumps up to samsung for spending on such an entertaining way of advertising their device. Not a Samsung fan but....... That's what I call MARKETING. 1:10...that was as far as I could make it. That was cheesy garbage, and it looked like they brought out the folks that design their phones to direct and produce this turd. That was the "cheap, flimsy plastic with all of the design sense of a Yugo" of the commercial world, which at least doesn't seem out of character for Sammy. Wayne Rooney, seriously? Messi and Ronaldo are at least considered in the best of the world conversation, but Wayne Rooney wasn't even in the top 3 in scoring in the EPL, let alone a top 3 in the world. Steven Gerrard was only 4 goals shy of Rooney's scoring total, and Stevie G turned 34 this year, is a holding midfielder, and he was THIRD in scoring for Liverpool. Rubbish. Wayne Rooney is overrated. Chicharito is the best striker at United. The nike add is way better than this just saying. So are you so what? It will make more money then you will.